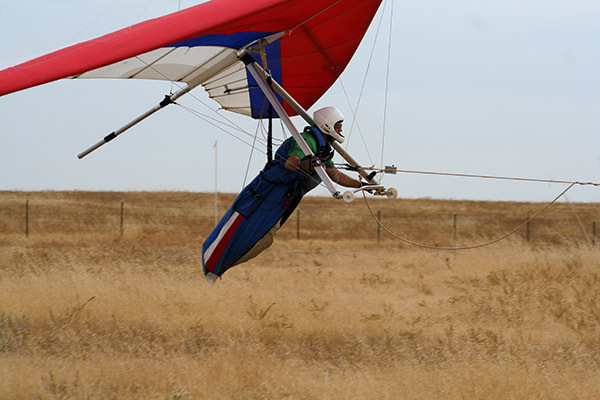 Sacramento Hang Gliding - Learn to Fly! For safety, new students participating in a well-designed program will start with ground runs and flights near the ground. As their steering skills improve, we can move our take-off point higher up the hill. When students have a good feel for airspeed, they can fly higher such as from the top of our training hill. As they become more proficient, they start learning new skills such as turns and landing approaches. Introductory Lessons which are about four hours long are the starting point for our training program. Some people know that they want to become pilots, some are thinking about it, and some just want to get some flying experience. Regardless of your ultimate goals, everyone gets some hands on flying fun! First we have to talk about some flight theory so everyone has an idea of what keeps a glider in the air and how we as pilots control it. Next, we pre-flight or inspect the glider. This gives us a chance to identify the parts of a glider and learn about their function. Before we hit the slope, we get to try out our new skills in the Simulator. The Simulator is a special stand that holds the glider and pilot. This allows the student to practice the correct inputs and movements to make the glider fly the way he or she wants. Next we go out to the shallow slope and try out our new skills. With the instructor running alongside, the student gets some hands on experience flying the glider. As the students skills develop, we move up the hill for higher flights. How high the students fly on the first day depends on their aptitude and wind conditions. 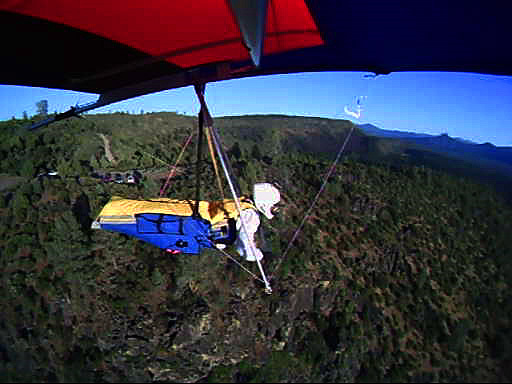 Usually by the end of the lesson, students are flying 5-6 feet off of the ground or within reach of the instructor. Anthony checks out his new harness on the simulator. Most people can get their first rating (USHPA Beginner Pilot) with our five lesson program. A Beginner Pilot can fly off the top of our 80 foot training hill with a good takeoff and landing and fly straight and level. The next rating that pilots need is the Novice rating. This is the “journeyman” rating where the pilot can start flying on his own. A typical Novice flight consists of the pilot towing up to 500 feet, flying around the field, and landing within 100 feet of a target. 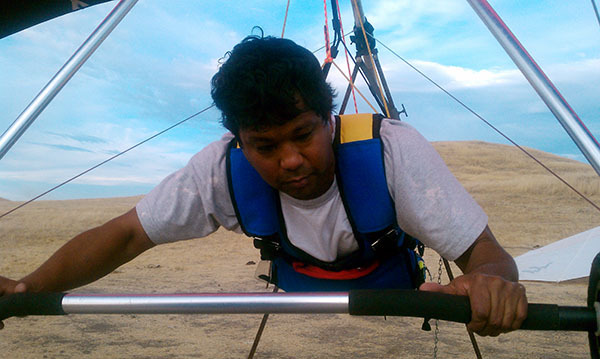 There are also harness and parachute skills that we cover. A Beginner pilot will typically need 5-10 lessons to get their Novice rating. We find more variation here due to student aptitude, prior aviation experience, weather conditions, and how often the student can train, etc. Kevin takes off at the tow site near Rancho Murieta. Along with ground schools covering more advanced flying techniques and micro-meteorology around flying sites, we have special skill clinics at the tow site and excursions to other flying sites such as Hat Creek. At this point in their flying careers, the new pilot can join more experienced pilots broadening their skills and building enjoyable memories. Anthony's first flight at Hat Creek.